Nominations for the popular music category of Taiwan’s 24th Golden Melody Awards were announced earlier in May. This year marks the first time in many years to see Hong Kong musicians competing against Taiwanese musicians on an equal scope. Media outlets also noted 2013 to be the Year of the “Cold” Newcomers, in which seven rookie singers – most still unknown – are nominated for the Best Newcomer award. The most well-known of the seven, Ann Bai (白安) and Jia Jia (家家), only released their debut studio album last December. Another noteworthy point is that ex-couple Jay Chou (周杰倫) and Jolin Tsai (蔡依林), together known as “Double J”, will be competing against each other for the Best Album award with Opus 12and MUSE, respectively. 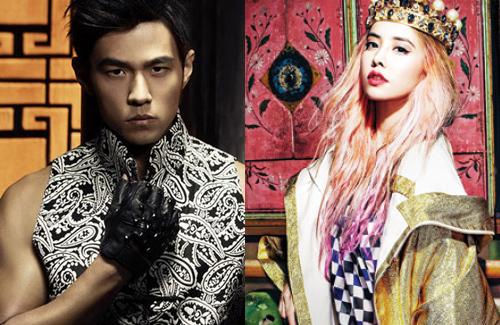 Another celebrity couple is Yoga Lin (林宥嘉) and first-time nominee G.E.M. (鄧紫棋), in which both will be competing for the Best Mandarin Singer categories. The 24t h Golden Melody Awards for popular music will be presented on July 6, 2013 at the Taipei Arena. Popular television host, Matilda Tao (陶晶瑩), will be hosting the Golden Melody Awards once again. I seriously don’t know how they nominate people. Because Rainie Yang is so beautiful but she never gets nominated… like wtf, really?! There are so many great songs. How the heck does G.E.M. get a nomination for best Mandarin female singer?! Totally surprised! Happy to see Khalil Fong on list!!! I’m so over Double J! Yes, they are on top of their game. I find Jay’s album more enjoyable than Jolin’s. Jay does well with ballads while I prefer only to listen Jolin’s fast dance songs. Jay’s new album wasn’t to new for me but Jolin’s album is to much pop. GEM’S album is awsome. Much more credible then Raine Ynag’s. @hellomynameis LOL “…because Rainie Yang is so beautiful but she never gets nominated”; last time I checked, this was a music award. However much its reputation has degraded over the years, the GMAs have done well in excluding idol-singers such as Show Luo etc. I just wanna know how the heck JJ can be totally left out of this year’s. I thought he fixed himself as a must-have but i guess not. I was scanning the list for JJ as well, his album this year was beautiful. So I don’t understand.